In Web Form Setup, click Navigate to URL(s). There are slight differences between desktop and mobile views. The view is responsive and will automatically detect the user's device (desktop computer or mobile device) and adapt accordingly. When multiple web forms are linked together ('next' forms), a link for each form shows on the left. Patient clicks a link to access each form. Unfilled forms are marked as NEW. When patient clicks Submit, Required fields are verified. If incomplete, the fields will turn red and patient will be asked to complete them. Forms with incomplete information are marked REQ on the left. Three buttons show on the top of the device: Previous, Next, Submit. Submit is only enabled on the last form. Required fields are flagged in red and verified when patient clicks Next. Patient must complete all required fields to proceed to the next form. The URL determines whether patient Last Name, First Name, and Birthdate is inherited on 'next' forms, whether there are 'next' forms, the clinic associated to the web form, whether a redirect occurs after submit, and whether typed signatures are allowed. See Web Form Setup. Pale yellow areas indicate where the patient should enter information. Birthdate validation is based on Windows region settings (format, date format) for the office. To import patient birthdates successfully into Open Dental, make sure the region settings expected on the web form match the region settings on the workstation running Open Dental. If web form signatures is turned on (see Web Form Setup), patients can electronically sign web forms using a mouse or stylus, or they can opt to type their name. When the form is imported into the database by the office, a date stamp will appear in place of the signature. 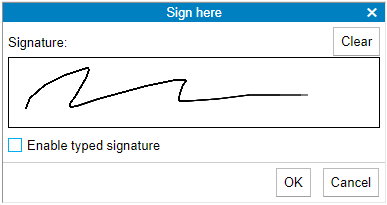 To erase a signature, click Clear. To type, check Enable typed signature, then enter the Full Name. Font support is dependent on the browser used to view the form. If the browser doesn't support a font used in the form, a supported font will be substituted. Free-form drawing will not work. Some of my customers are unable to view my web forms on mobile devices (e.g. cell phones) without scrolling to the right. Use a different device with a larger screen size, such as a personal computer or tablet. Most long forms, such as registration or medical history forms, are easier to fill in on personal computer due to the amount of information requested. Create a smaller custom sheet and use it as a web form option. This may include offering two links on your website: one for patients using a personal computer and another for patients using a mobile device with a smaller screen size. Would a patient (or parent/guardian) be able to digitally sign a web-based consent form? The practice would do better to have the patient (or parent/guardian) complete the document online, then sign it in the office, rather than online.